This category contains posts that don’t naturally fit into the other categories. Since the mid-80’s, the US Health Care system has slowly fractured into discrete pieces. The movement started with Emergency/Urgent Care and Family Practice physician specialties, then spread to all physician specialties. The first Emergency Physician Training Program was started in 1970 at the University of Cincinnati, the first graduating “class” was in 1972. The American Board of Emergency Medicine was approved by the American Board of Medical Specialties in 1979. It took about 10 years for enough physicians in this specialty to be trained to create a tipping point in manning hospital Emergency Departments with Board Certified physicians. Before 1990, the majority of EDs were manned by community physicians “moonlighting” in EDs to get extra income, or, they were manned by community physicians who formed ED physician practices but were not board certified. By 2000, with the exception of some small rural hospitals, the vast majority of hospital EDs in the US were manned by Board Certified ED physicians with regional and national practices providing the supply to hospitals that didn’t directly hire their own ED physicians. Until the late 1980’s, if a patient presented to an ED, their primary care physician was called and was expected to come in and see the patient. The primary care physician could defer to the physician in the ED, but that didn’t occur often as, since the ED was manned by community physicians, primary care physicians were afraid they would lose their patient to the physician in the ED. Similarly, Urgent Care Centers pretty much failed in the 1980’s for the same reason, that is, the primary care physicians believed the physicians in the Urgent Care Centers were using that as an entry point into the community and would recruit their patients. The primary care physicians also felt that they knew the patients better and, for continuity of care reasons, it was better for the primary care physician to see their own patients. This was also expected by the health care system and the patients, as well as by the physicians themselves. It was the culture. Once board certified ED physicians became the norm in the EDs, the primary care physicians became more comfortable allowing ED physicians to see their patients. It wasn’t until around 2000-2005 that the primary care physicians began routinely referring acute care patients to Urgent Care Centers, due to reasons outlined below. This was the first step of the fracturing of the system. A physician now only had to go to the ED to see a patient if the ED physician either needed expertise to evaluate and treat a patient, or, the patient had to be admitted to the hospital. Some hospitals allowed ED physicians to write admission “holding” orders for the admitting physicians, so the admitting physician didn’t have to run to the hospital immediately. This was Fracture #1 in the Health Care System. The American Board of Family Practice was officially recognized in February 1969 by the Board of Medical Specialties. Before that, these physicians were called General Practitioners whose training was limited to Medical School plus one year of internship, usually a “rotating” internship (rotating through several specialties, e.g., Internal Medicine, Surgery, OB/GYN, etc.). At the beginning, there weren’t many Family Practice training programs, so, to get members into the specialty, you simply had to pass a “Family Practice” test to get certified. This was called being “grandfathered” in. The first Family Practice Residency Programs began in 1968. By the mid-1980’s, the “grandfathering” option was eliminated; you had to attend a Family Practice Residency Program to take the certification test. Initially, Family Practitioners could do anything related to the practice of medicine. They did surgeries, delivered babies, did ICU care, etc. Around 1985, this started to evolve into a more restricted (mostly self-chosen restriction) practice, eliminating surgery and OB. In some cases, hospitals started to restrict inpatient privileges for Family Practitioners, especially in urban areas where the board certified specialists in areas like surgery and OB were so plentiful, it was risky (malpractice risky) to the hospital to allow Family Practitioners to do these procedures since their depth and breadth of training was less then the specialists. The second fracture in the system was due to the Family Practitioners. In the mid-1980’s Family Practitioners began eliminating their hospital practice entirely. They felt their training was more ambulatory biased and they began to feel “uncomfortable” with hospital-based medicine. I was in a medium sized city in 1986 when a Family Practitioner opened a practice in a town about 8 miles away from our city. His patients started showing up in the ED with the message that their primary care physician told them to go there to get admitted. The Family Practitioner had never applied for hospital privileges. Back then, if you were a primary care physician with hospital privileges, you took “service call” in rotation with the other primary care physicians. Service Call was a quid pro quo for being allowed to care for your patients in the hospital. When you were on service call, usually a week at a time, you admitted any patient who presented to a hospital where the patient’s physician was not on the hospital staff. This could be a traveler or visitor to your city, someone who lived there but never chose a primary care physician, etc. So, when a physician practicing within the service area of our hospital just started sending his sick patients to the hospital to be admitted by the service call physician, it created quite the stir, especially since the Family Physician didn’t even have the courtesy to inform the hospital that he would be doing this. The medical director and administrator of the hospital, at the request of the Medical Staff Executive Committee, met with this Family Physician who just said he wasn’t going to apply for privileges, he was still going to send his patients to the ED, and there was nothing the hospital or the Medical Staff physicians could do about it. Over the next 20 years, the vast majority of Family Physicians stopped applying for hospital privileges and became 100% ambulatory/outpatient only practitioners. The Internal Medicine physicians began following suit, so that, by 2005, virtually 100% of urban and suburban primary care physicians were ambulatory practitioners only. So, there is Fracture #2 in the Health Care System. Enter stage left, Fracture #3: The emergence of the hospitalist. If your not keeping count, the hospitalist is the third physician type that is needed to do what one primary care physician did before 1990. Physicians were going into ED, and then, hospitalist practices, which subtracted them from the primary care base, and there wasn’t a decrease in the demand of patients who needed primary care. You can start doing the math as a preparation for the blog about why we need (or don’t need) 100,000 more physicians by 2030. In a 1996 New England Journal of Medicine article, Dr. Lee Goldman and Dr. Robert Wachter coined the term “hospitalist.” By 2005 there were 5000 members of the Society of Hospitalist Medicine. As of 2014, there were 44,000 hospitalists in the United States. (The numbers are from the Society web page) It is the fastest growing medical specialty in history. There is no official Hospitalist Residency Training program. The first hospitalists were mostly enterprising Internal Medicine or Family Practice physicians who saw a gap in care, a void, created by the primary care physicians. In a similar time frame, hospitals started directly hiring Internists as hospitalists, since Family Practitioners and some Internists had chosen to not do hospital medicine, and the hospitals couldn’t wait for hospitalist practices to form. The American Board of Hospital Medicine was founded in 2009, so you can see how young the specialty is. However, physicians acting as hospitalists are mainly Internal Medicine physicians who are adequately trained in hospital medicine. As a matter of fact, The American Board of Internal Medicine has a special certification, “Focused Practice in Hospital Medicine”. Now, when you go to the hospital, you never see your primary care physician. You are cared for by a hospitalist who is doing “shift work” (as a matter of fact, the ED physicians and Urgent Care physicians are also doing shift work). The usual schedule is 12 hours on, 12 hours off for a week, then a week totally off, then the 12 on 12 off, a week totally off, etc. A hospitalist, an ED physician, and an Urgent Care physician generally do ~14 12-hour shifts a month. That’s 42 hours a week on average, what most people consider “normal” work week hours (40 hour week!). A primary care physician in 1985 worked 60-80 hours a week. And, the primary care physicians are also doing shift work. The usual number of hours a week for a primary care physician now is 32-36 hours of direct patient care a week plus 4-6 hours of non-patient contact time. They only go to their offices. They expect the same income as the 60-80 hour physician from 1985 who went everywhere. As noted above, there are now 44,000 hospitalists in the US. Internists used to be primary care physicians with patient panels of about 1800 ambulatory patients. 44,000 x 1800 = 79,200,000 people who would have had a primary care physician had primary care physicians still done both ambulatory and hospital medicine. Here’s a reason why there’s a doctor shortage because the Medical Schools didn’t ramp up admissions and graduations to produce 44,000 extra primary care physicians since 2000. We’re having to import them from foreign countries and the communities in the US still can’t keep up. Of course, the medical profession keeps blaming it on the aging population, which is a factor, but this fracturing is having more of an impact than the age wave. Plus other factors I’ll get into in a later post. At this point in the discussion, there is now a need for four, count ‘em, four physicians to do what one primary care physician did before 1990. And this now isn’t solely a primary care phenomenon. Since around 2005, every non-surgical specialty has adopted this model. Yes, there are now Cardiologist, Neurologist, OB/GYN, Gastroenterologist, etc. (you name it for non-surgeons) hospitalists! Surgeons haven’t totally converted because their income depends on the number of surgeries they do. But they do have APC’s (Advance Practice Clinicians) doing their hospital rounding and a significant proportion of their outpatient work. Surgeons want to be in the OR as much as possible, especially in the Fee For Service reimbursement model. Maybe that will change with capitation, value based reimbursement, bundled payments, etc. Is there more? Well, yes! There is. Fracture #4! Primary care physicians used to be obliged to follow their patients anywhere they ended up. Most people think about the above four venues, but there are more: Skilled Nursing Facilities and Nursing Homes. It now won’t come as a surprise to you to know that primary care physicians no longer go to Skilled Nursing Facilities (SNF) or Nursing Homes (NH), which the primary care physician in 1985 did. It was similar to admitting your patient to the hospital when they needed that level of care. It was expected that you would follow the patient to these facilities. If they were in a skilled level facility, you had to see them every 30 days. If they were in a nursing home you had to see them every 60 days. These regulatory time frames were moot if your patient was sicker and needed to be seen more often. There were two separate movements that removed primary care physicians from going to SNFs or NHs. One was, they simply refused to go, just like the primary care’s refusal to go to hospitals. The other was, SNFs and NHs refused to let primary care’s see their patients, they hired “SNF-ists” and NH Medical Directors to see the patients. The main reason was, the primary care’s weren’t responsive enough when there were patient problems and they weren’t adhering to the regulatory time frames for response to urgent calls from the facilities or signing verbal orders. So, the primary care’s essentially removed themselves from these venues, one way or the other, the latter related to another of my blogs about their shift work mentality. Now there are SIX physician FTE types who are doing what it took one primary care physician to do in 1985. And they are all doing shift work. Future posts will explain why physicians and APCs prefer shift work. By the way, I was there in 1985 so I know what the 1985 reality was. In 2016, according to the Kaiser Family Foundation, there were 441,735 primary care physicians in the US. There were 484,384 Specialists. The 44,000 hospitalists and 42,000 ED physicians are in the Specialist number. There are also 20,000 physicans in Urgent Care Centers. (All of these numbers come from their own society’s latest postings.) This adds up to 106,000 physicians out of the primary care practice arena. 106,000 x 1800 patients = 190,800,000 people! There are only 360,000,000 people in the USA! Wait, 441,735 x 1800 = 795,123,000 people! Of course, the 441, 735 probably included retired or semi-retired physician, but, doesn’t it look like there are enough primary care physicians? Unless, of course, they aren’t caring for 1800 patients each, or the way they practice limits their availability. The numbers say more like 800 patients each. More on this in later blogs. The point of this post is, it’s the physicians who fractured the US health care system. The biggest problems from this are: 1. Lack of knowledge across the system about individual patients, 2. Lack of continuity of care, 3. Inadequate communication across the health care continuum, 4. The “too many cooks spoil the soup” concept (practitioners don’t agree with each other about how the patient should be managed and change care regimens set up by another physician), 5. Repeating tests and services, 6. Patient confusion over what their care plan is leading to deficient self-care, 7. Important things getting lost in the system, falling through the cracks, so to speak, 8. More opportunity for medical errors due to hand-offs. To try to mitigate this, health systems (and health insurance companies) have added non-physician FTE’s (Full Time Equivalents, basically, a person who works 40 hours a week) to the system: Case Managers, Care Coordinators, Nurse Navigators. These will be discussed more in future posts, but, this is now NINE FTE doing what ONE primary care physician FTE and his practice nurse did in 1985. And I haven’t even gotten into the Advanced Practice Clinicians (APC’s)(formerly called “mid-level providers): Nurse Practitioners, Physician Assistants and Pharmacist Clinicians. These APC’s do portions of what a primary care physician did in 1985, like, managing stable hypertension or diabetes, seeing same day acute patients (colds, sprains, etc. ), adjusting meds for chronic illnesses like COPD and depression. No one has decreased the number of physicians. All of these FTE’s are added to the functioning and cost of the health care system. And the final, to me the craziest, FTE addition of them all is the “scribe”. What, you may ask, is a scribe? A scribe is a person (now they are actually certified as a health care scribe! A new health care industry, scribe training and certification!) who enters information into the Electronic Medical Record (EMR) for practitioners. As you might have experienced, almost all physician practices, hospitals, SNFs, etc. are now on EMRs. The EMRs are so poorly designed for caregivers, there is now an FTE type, the scribe, who follows the practitioner around (physician or APC) and enters most everything into the EMR because it takes too much practitioner time. Yes, EMRs made practitioners less patient care productive. As a matter of fact, there have been several articles published in 2016 and 2017 showing that practitioners spend 50% of their in office time on the EMR instead of seeing patients (i.e., 4 hours EMR, 4 hours seeing patients). Meaning they can’t see as many patients because of the unintuitive design of EMRs. I don’t know what a scribe is paid, but, it is an additional cost to the system, not even counting the training and certification costs. So, that’s 10 FTE doing what ONE primary care physician and their nurse did before 1990! Anyone want to know why health care costs keep going up? And this is just one factor (no one wants to talk about)! There seems to be a news story about it almost every day. The statistics are horrifying. Since 1999, the rate of overdose deaths involving opioids—including prescription opioid pain relievers and heroin—nearly quadrupled, and over 165,000 people have died from prescription opioid overdoses. (HHS Bulletin The Opioid Epidemic: By the Numbers). Remember the year, 1999. We are spending 55 billion dollars a year in health and social costs related to prescription opioid abuse each year and $20 billion in emergency department and inpatient care for opioid poisonings. (Source: Pain Med. 2011;12(4):657-67.1 2013;14(10):1534-47.2). Three words: The Joint Commission. Yes, that accrediting agency that accredits your hospital. Back before 1995, physicians were very judicious with their prescribing of opioids. The general opinion then was you should minimize prescribing of opioids and you were strongly discouraged to prescribe them for chronic pain. We were told they didn’t really work for chronic pain because the neural pathways were different between acute and chronic pain. The State Pharmacy Boards were monitoring your opioid use for anything but codeine containing pain medications. It’s 1983. About every 4 months or so, a male patient would come in to see me. He had a diagnosis of Migraine. This is the only thing I saw him for. He had no other active medical problems and, according to him, he generally used over the counter pain meds for most of his migraines. However, occasionally he got a really bad one and had been prescribed a small prescription of Dilaudid (hydromorphone, a pretty strong opioid) for those by a neurologist. He would ask for 10 of these. That meant he used about 2 a month. This didn’t seem like a problem to me, so I would refill this for him. In early 1984, two people from the Board of Pharmacy visited my office in the middle of my afternoon session. They told me that they expected that I would not prescribe Dilaudid for this patient again. The reason was, the patient had been driving up and down about 200 miles of the Interstate, visiting multiple doctors asking for the same thing, 10 Dilaudid’s. No individual physician thought it was a problem, just like me. He was actually getting several hundred during a four month period. Yes, they were watching and they did something about it. It’s 1985. I’m in a different state from Example 1. I saw a new male patient; I’d never seen him before. He comes in complaining of a bad cold and a really bad cough. It is keeping him up at night. This happens often when he gets a cold. He just moved here from California and his Primary Care in CA prescribed him Tussionex because it was “the only thing that worked”. I examine him, his exam is consistent with a cold. I prescribe him 200ml of Tussionex, which I had never heard of before that day, but it appeared to be a reasonable anti-tussive in the Physicians Desk Reference (PDR). There was no mention of anything like abuse potential in the PDR. Tussionex is comprised of hydrocodone and chlorpheniramine (an antihistamine) in time-release beads. The next week, a fellow from the Board of Pharmacy comes in and tells me the patient to whom I had prescribed Tussionex was going around getting prescriptions from multiple physicians. He informed me that Tussionex was very addicting and I shouldn’t be prescribing it at all! Yes, they were watching and they did something about it. Back then, before 1995, I rarely, if ever, prescribed anything stronger than Tylenol #3. That’s the way I was trained. Stronger opioids were for terminal cancer patients, not the acute pain we saw in the ER and in our offices. We mostly told patients to use aspirin, Tylenol or ibuprofen (which went over the counter in 1983). And, as I mentioned above, opioids were frowned upon for chronic pain. If anyone was on them for any period of time you worked to get them off. In my case, they got the opiates from surgeons after an injury or surgery, not initially from me. Just to give you an idea about how reluctant we were to prescribe opioids, here’s a story from when I was in training. I was the Senior Resident in training. One of my and my intern’s patients was a fellow who was admitted with abdominal pain to the GI service. He was highly suspected of being a drug abuser and also of selling drugs. He was in the middle of a several day work up when a long holiday weekend “interrupted” his work up. The patient brokered a “weekend pass” from the attending since nothing was going to happen for three days (that’s the way it was back then!). The patient requested Percocet (oxycodone and acetaminophen) for pain control. The attending physician told me to write out a prescription for 30 Percocets. We argued with the attending that the patient was more likely to sell these than take them and we didn’t want to write the prescription for 10 Percocets a day (a lot). I finally told the attending that, if he wanted the patient to have the Percocets, he would have to write the prescription himself, which he did. When the patient came back, he had no leftover Percocets. So he either took 10 a day or he sold them. We always suspected that he sold most of them. In 1996, The American Pain Society and other pain societies began advocating for the use of opioids for chronic pain and suggested that pain should be the “fifth vital sign”. This notion was based on only one journal letter (one paragraph with minimal details, not peer reviewed, no statistical analysis, no description of the study design, etc.) by one pain specialist without any credible data to support his recommendations (Jane Porter and Hershel Jick, MD, “Addiction Rare In Patients Treated With Narcotics”, NEJM, Vol. 302, No. 2, 1980). The Veteran’s Administration agreed with that approach and declared pain as the fifth vital sign. The Joint Commission picked up on this and in 2000 declared that all accredited hospitals had to adopt pain as the fifth vital sign and generated standards not only to that effect, but that all patients had to be assessed, treated and reassessed and that the medical record had to show decreases in the patient’s pain level reporting. They advocated that adequate pain management was a “patient right”. That’s how strongly The Joint Commission pushed this. Hospitals, including academic hospitals, were afraid of getting a “finding” (a ding) which would affect their accreditation status, so they advocated using whatever medication necessary to make sure patients’ pain scores decreased during their hospital stays. And the patient more than often went home on these medications. The Joint Commission also included that staff needed to be educated about pain and its treatment, which was aligned with the Pain Societies’ new guidelines promoting an increase in the use of opioids for acute pain and opioids for chronic pain. So, physicians in training were now being told to prescribe the more powerful opioids. Vicodin (hydrocodone and acetaminophen) became the drug of choice for most physicians. Since The Joint Commission was accrediting about 4500 of the 5500 hospitals in the US, the impact was incredible. (By comparison, the VA has only 168 hospitals). The Pharmacy Boards were no longer dogging opioid prescribing like it did before 1995 because, well, everyone thought it was the right thing to do. For more detailed information about this see the JAMA supplement written by David W. Baker, MD, MPH from February 23, 2017. All of this shifted the culture. But it started with the American Pain Society, the VA system and The Joint Commission (who had the largest influence by far). I had to take a hiatus from seeing patients between 1996 and 2003. When I got back into practice in 2003, I was seeing same day appointments and I couldn’t believe how many patients were on Vicodin and Percocet! Especially Vicodin. I don’t think I ever prescribed Vicodin before 2003. Physicians now had a very low threshold for prescribing opioids. Understandable, since that was how they were trained. It was (maybe still is) so bad that, I know physicians who were prescribing Vicodin for coughs! (Remember Tussionex has hydrocodone in it, it is a cough suppressant). You can imagine what happened to those! Here’s a personal example. I had a minor orthopedic surgical procedure. It was under general anesthesia in an outpatient surgery center. My wife took me home, then went to the pharmacy to fill the prescription the surgeon had written for me. It was 40 Percocets! I took one. I destroyed the other 39. There are studies showing that people use only about 10% of the opioids prescribed for them by surgeons. (“Prescription Opioid Analgesics Commonly Unused After Surgery”; Mark C. Bicket, MD, et al; JAMA Surgery Published online August 2, 2017)They frequently get 40-60 tablets and use only 4-6 tablets. Gee, what happens to the other 34-54 tablets? In the JAMASurgery systematic review, only 9% of patients disposed of their opioids according to FDA recommended disposal methods. As the opioid epidemic evolved there was more and more concern that The Joint Commission (TJC) stance was leading to an over reliance on opioids and over prescribing by physicians. TJC started to back off on the strength and emphasis of its pain standards and eliminated them in 2009. Unfortunately, the damage was already done. Now the trend is reversing again but not as fast and thorough enough yet. The recent recommendations in the US tend to still be medication based, not including alternatives to medication, or recommending not prescribing opioids at all (It’s hard to get addicted if you never get an opioid). People did relatively well before 1996 when we were discouraged from using opioids. Why not return to that? The Scottish recommendations/guidelines for pain control , for example, are predominantly non-medication based. Maybe the US efforts are more medication based because of the Pharmaceutical industry influence in the US, which is much stronger than other countries. I took a chronic pain elective in 1981 while in training. That program was run by an internist. The main goal of the program was to eliminate opioids if they were being prescribed, and use non-medication interventions (like guided imagery, relaxation exercises, etc) instead of medications. He was specific with patients about the fact that the program would not eliminate their pain but make it manageable and they would live a normal life. I took a lot of notes and photocopied a lot of protocols and articles while in that program and used his techniques in my practice. Since the opioid epidemic reaction by regulators (meaning, for example, I have to take an all day pain management course every three years to maintain my medical license) I have attended two mandatory pain management seminars. In both, 100% of the teaching is related to using medications. These seminars were led by a University medical school group of “pain specialists”. They never talked about the non-medication interventions I was taught and that are in the Scottish pain treatment guidelines. I actually spoke to them about this after the seminars and their answer was, there wasn’t anyone available to do the non-medication interventions, and they weren’t interested in building them at the University. I also emphasized that managing chronic pain is a PCP issue. Unfortunately, the PCPs nowadays have no idea nor do they have the support systems to do this so patients get referred to pain specialists who are mostly anesthesiologists who want to give everyone injections. Anytime I described the way chronic pain should be managed, it fell on deaf ears. It is time and labor intensive for practitioners, but, it works. I Have many stories about how successful it is. To my delight (but probably not of interest to others) an article came out on May 18, 2017 advocating for exactly what I’d been taught 30 years ago! (Primary Care of PatientsWith Chronic Pain, Jill Schneiderhan,MD, et al, JAMA, May 18, 2017). If we could swing the management of chronic pain as described in this article and stop prescribing opioids stronger than Tylenol #3, we’d actually be doing something that benefits the patients. Anyway, if any of my loved ones died of an overdose that started with prescription drugs prescribed by a practitioner, even if the overdose drug was a different drug like heroin, I would sue The Joint Commission. My opinion is, they were negligent in adopting the standards they did; they were the major impetus to the current opioid epidemic. They did not do their due diligence relative to the strength of the literature/data or the consequences of their position and their standards, and their standards were ultimately the major influence on physician opioid prescribing behavior. Health care institutions and systems have existed in the US since colonial times. Globally, even longer especially in Europe. You would think that by now, running health care systems would be so refined and reliable that they would beat out the airline and nuclear energy industries. Regrettably, this is not true. A recent British Medical Journal article cited Medical Errors in the US accounted for ~250,000 deaths and was the third highest cause of death in the US (Medical error—the third leading cause of death in the US. ; Makary MA, Daniel M. BMJ. 2016;353:i2139.) This number is larger than the numbers previously reported by the Institute of Medicine because the IOM numbers are inpatient cases only. Mr. Makary, through the use of other information sources, “extrapolated” the data to estimate the rate for the US population, which would include ambulatory deaths. That would give one pause. But the situation is even broader than this. US health care systems are notoriously inefficient. They are highly reliant on people providing their products. And generally people have a 2 sigma error rate (95% accuracy) when they are doing only one thing at a time. This can fall to 1 sigma (68%) if they are doing more than one thing at a time, especially complex tasks, which are common in health care. There is abundant waste in health care, estimates by the Rand Corporation and the Institute of Medicine being in the range of 30-40% waste. No other industry/business would accept this level of waste. Definition of waste: an act or instance of using or expending something carelessly, extravagantly, or to no purpose. The US health care system is guilty of all three of the “acts” in the definition. So, why is this? Why is it that health care systems, which have your LIFE at stake, are so inefficient, wasteful and error prone? The administrators that run the health care systems are mediocre. There is a lack of physician leadership. Most clinical managers in health care are licensed clinicians who never had any formal management training. Health care management training is woefully inadequate. Health care management is a task oriented management system vs. a process management system. First, let’s go over some definitions. What is the definition of a “leader”? Depends on whom you ask! Dictionary.com definition – a guiding or directing head, as of an army, movement, or political group. Gallup definition from “The One Thing You Need To Know” – Leaders provide a vision and are able to motivate people to follow them to achieve that vision. Team Technology definition – Leadership is setting a new direction or vision for a group that they follow, ie: a leader is the spearhead for that new direction. In my experience, the Gallup and Team Technology definitions are more closely related to superior performances. What’s the definition of a “manager”? Merriam-Webster – a person who conducts business or household affairs. Dictionary.com – a person who has control or direction of an institution, business, etc., or of a part, division, or phase of it. Team Technology – A Manager controls or directs people/resources in a group according to principles or values that have been established. The difference between a leader and a manager is important. Not all people in positions of leadership can actually really lead. They act more as managers than true leaders. This is the biggest issue in health care. Who people call (or call themselves) leaders are actually just managing. This creates inertia, because there is a lack of vision. The administrators who run the health care systems are mediocre. I’m here to tell you, it starts at the top. And by the top, I mean the C-suites in health care. The administrators. The MBA’s who are supposed to be running the operations of the health care institutions in our country. Essentially, there is a lack of effective administrative and physician leadership in health care. Let’s start with the administrators. The “MBA-types” running the health care systems and institutions in the US are generally “C-players”. Oh, there’s an occasional B minus- player, and they stand out and appear to be A-players, but, really, they are B minus-players in a sea of C or less players. I have personally never seen such a group of rigid thinking, uncreative, and just plain underachieving people when it comes to administrators running health care systems. Their forte’s are building buildings, starting up new services, like a day surgery center, and manipulating finance numbers to maximize profits. For the rest of running a health care system, they are woefully inadequate. The main reason for this is, the A and B-players are in industries that require brains and assertiveness and pay a heck of a lot more for it. Unless an MBA is in the upper echelons of a multiregional or national health insurance company, they don’t get paid nearly as well as, say, a Donald Trump business executive, someone on Wall Street, someone at GE, someone at Bank of America, etc. So, the health care industry attracts the next levels down. The ones that can’t make it in the higher-powered industries. The below B-players. The smaller the hospital, the lower the GPA score. Yes, all the way down to the “F” level. I can’t tell you how many times I’ve sat across a health care administrator’s desk, explaining something four different ways and they sit there looking like a deer looking into headlights. The sad part was, they and their MBA colleagues discount what the clinicians say or propose. Mainly because they don’t understand it. And clinicians are generally smarter than the health care level MBA-types. That’s why they hardly ever get along, the clinicians can see through them. The MBA’s don’t like that. Now, I’m not saying there aren’t any C or less clinicians, there certainly are! But they don’t control complex services impacting thousands and thousands of patients. I already told you about the COO who stated we didn’t have to do anything urgently about patient safety because it had been going on for a long time. And the administrator who thought it was unnecessary to train ICU nurses. Here’s another true story about how these MBA guys operate. I started a job as the Regional Medical Director of a Staff Model HMO. The Regional Administrator and Regional Marketing Manager were vacant positions. There was a part time HR manager. That’s it, me and a part time HR manager. Since I had done some contracting with provider offices in another position, I was tasked with contracting with the HMO’s network providers. This was usually part of the administrator’s job. I had never contracted with a hospital before, but I understood their operations. The Contracting Specialist had initially been hired to be the Regional Administrator but was demoted (hence the vacant Regional Administrator position. See what I mean about C-players?). So, the MBA was incapable of doing this work and they tasked me, the DOCTOR, to do it. The Contracting Specialist for the region and myself sat down with the executives of the first hospital on our list. My strategy was to try to understand their cost structure and then fashion a deal where we both “made out”. I had studied books like “Getting to Yes.” I started the conversation by saying we didn’t want to ratchet down on the hospital fees we would pay to the detriment of the hospital but I also couldn’t afford them a lucrative fee schedule that would negatively affect our health plan budget for health care services. My first category for negotiation was for Lab services. I asked the Execs if they knew the profit margins on the tests in their Lab, like, what was their margin on a Complete Blood Count (CBC). I used to deal with this in my private office, so I knew how this should go. In my practice, I paid a reference lab $10 for a CBC and charged $20 for it, so my margin was $10 or 100%. The CFO and CEO said they didn’t have that data. I asked them if they knew if their Lab made money for them or lost money. They said they didn’t know. I shifted to the X-ray department and asked the same two similar questions: Did they know the margin for the X-ray tests or whether the X-ray department made or lost money. They said they didn’t know. I asked them how they managed the financials of the hospital if they didn’t know where in the hospital they were making or losing money. They said they just looked at the total expenditures for the entire hospital then looked at their total revenue stream. If it looked like they weren’t going to meet their financial/margin goal they renegotiated insurance contracts for more money. Is anyone reading this running a business? Is this how you operate? And remember, I’m the Doctor! There’s no MBA or HCA or any other business school acronym after my name! They couldn’t target any areas where they were losing money and attempt to stop the hemorrhage. They just did what hospitals are wont to do – it’s called “cost plus”. You just look at the roll up of your expenses and manipulate the price to make a profit margin. This is the main tactic these MBA guys use and is a foundational reason why hospitals and health care systems are so inefficient. Instead of fixing where inefficiencies exist, they just price to pay for the waste. I fulfilled my obligation in the National Health Service Corp (NHSC) in 1985. During that NHSC tenure, I was a whistleblower on an administrator who was embezzling money from a “community” owned mini health care system. I had gained access to the financials and figured out what was going on. So, I got somewhat proficient reading financial spreadsheets. Part of the operation’s revenue was a capitated HMO contract. I got to see how this affected the revenue of the health care system, with all of the nuances of a capitated environment, like risk pools, withholds, etc. In 1986, I was in a different state in a medical group with a significant number of patients as members in a capitated health plan contract. I was in a small satellite clinic, and the office manager would share the financial information with me. The way the plan worked was, we were given a lump sum per patient per month and we had to pay everything except hospital bills. I actually had one woman in a back office who paid the claims, was the Provider Services representative, and the Member Services representative. I did all of the Utilization review and non-hospital provider contracting. Yes, just two of us! Because of this situation, I was able to get a hold of the HMO contract. After reading the contract, I met with the administrator of the medical group. I told him, my estimation was, the HMO contract was not a beneficial contract for the medical group. There was too much risk for the way the member premiums were being allocated between the HMO and the medical group, i.e., the group was being underpaid. He scoffed at me and told me the contract was a huge boon to the group. I complained to the physician leaders of the group (remember, I was the newbie) who told me the administrator knew what he was talking about, I should stop complaining. Six months later, the medical group was on the brink of bankruptcy. Another HMO bought out the HMO with whom we had the contract. The new HMO’s initial assessment was, our medical group and three others in their merger and acquisition were on the brink of bankruptcy DUE TO THE ORIGINAL HMO”S CONTRACT!!! Our medical group actually did go bankrupt. The other three survived because the new HMO revised their contract terms TO PAY THEM MORE FOR WHAT THEY WERE RESPONSIBLE FOR! Our group was too far gone by the time that offer arrived. Thanks to the administrator. Here’s one more. I have about a hundred, but, you should be getting the point. I’m in a four-physician clinic that belongs to a large multispecialty group. It’s been losing $500-750,000 a year. It’s only a three-year old clinic. I’ve been there a year and have been at the meetings where everyone is bemoaning the losses. The clinic consists of two Internists and two Pediatricians who are on call every other day and every other weekend. The office hours are 8:00 AM to 8:00 PM Monday -Friday, which means the physicians have to work in shifts: 8:00 AM-4:00 PM and 12:00 noon to 8:00 PM. There are Saturday morning office hours from 8:00 AM-1:00 PM. Whoever is not on call for the weekend staffs the Saturday clinic. The clinic staff consists of two receptionists (one for the Internists and one for the Pediatricians), 1.5 FTE clerical, 1 FTE X-rays, 1 FTE lab tech and an office manager. There is a nurse for each physician. The first thing I did was start doing busy studies of everything in the clinic, compiling graphs of the frequency of use of services. I figured, if it was a good method for tracking vital signs, it should work for something like this. I had a graph for physician visits by day, session, hour, etc. I had graphs for number of X-rays per session, number of lab tests per session, number of cancellations, number of no shows, appointment slot vacancy rate, etc. No one had tracked these before. In the evenings, the X-ray rate was 0-1 X-ray per session (mostly zero). The lab test rate was 1-3 per session (mostly 1-2). The no show, cancellation and vacant appointment slot rate was highest on Tuesday, Thursday and Friday evenings. We lost tons of money on those evenings between staff costs and wasted supplies (supplies in the lab and X-ray departments which had to keep things running despite not doing anything). The Saturday clinic was breakeven for Internists and the Pediatricians made money. I suggested that the clinic close for the evenings on Tuesdays, Thursdays and Fridays and that there be no X-ray after 5:00 PM on days the clinic was open until 8:00 PM. This was initially met with resistance because the administrator kept saying we were closing at times when there was activity (revenue) opportunity. I finally convinced the physician leaders to try it for six months (they owned the medical practice). In six months, we were running at breakeven. I guess they don’t teach operations measurement and improvement in those MBA schools. This is a national problem. Doctors are generally not admitted to medical schools for their leadership abilities. It is more for their academic achievements and their individual drive. They get no leadership or management training. They are trained to assess, diagnose and then give orders within a task oriented environment. In my experience, only about 2% of the physicians in the US physician population are true leaders. Some of the other 98% get into leadership positions, but they are far from being leaders. And half of that 2% don’t want to leave their practices for leadership positions. The thing is, when these true leader physicians get into leadership positions, magic happens. They can be truly transformative. Unfortunately it’s not a common occurrence. Not that the non-true-leader physicians don’t assume leadership positions. Here’s a figure from the 2017 Medscape Physician Survey about it. 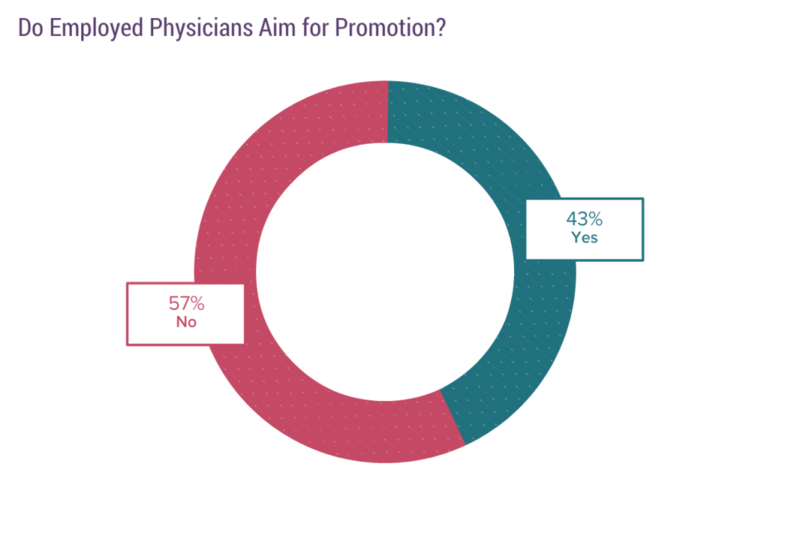 A significant proportion of physicians want a promotion. My interpretation is, they want an escape. An escape from seeing patients (more evidence that being a physician is more of a job nowadays). 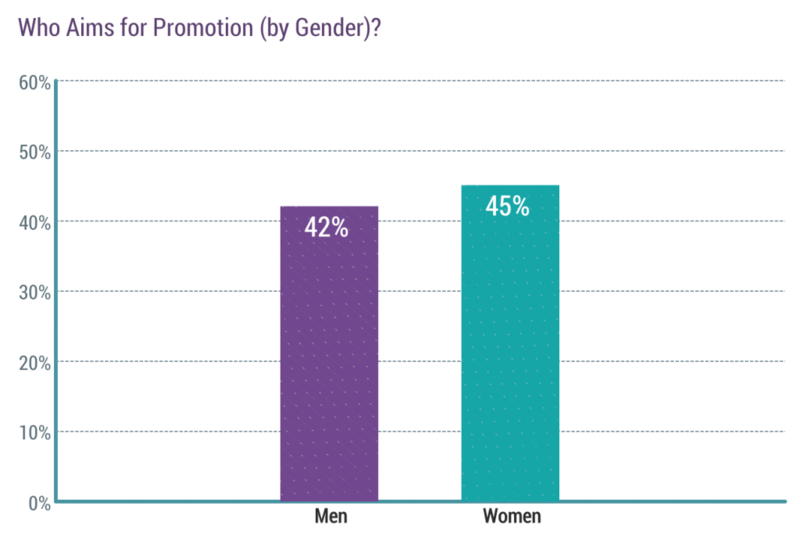 A higher percentage of women want a promotion than men. Probably part of the same phenomenon where women are part time about three times more than men. Child-rearing and lifestyle. Being promoted means more possibility of predictable work hours. So, what happens is, you have smart but not leadership skilled physicians teaming up with mediocre MBA administrators. Result = lack of leadership, no vision, no real progress. What you generally get from the non-true leader physicians is a lot of talking. Intelligent talking, but just talking. They haven’t been trained or have the skills to make administrative/operational things happen. It’s parallel to what happens on the clinical floor. Doctor decides something should be done, tells staff to do it. Someone else has to make it happen. Same dynamic. Except on the clinical floor, someone does it. In administration, usually no one does it. So things stay the same and the physicians get frustrated. Then they start to complain. Next, they are asked to step down for being a curmudgeon. This sets up the classic antagonism between hospital administration and the doctors. You have no idea how many disparaging comments I’ve heard administrators say about physicians in meetings and conversations. When I was the CMO of a health plan with a physician President, we banned any staff member from saying anything negative about a clinician. It would affect every interaction they would have with a clinician. It’s called transference. Set-up: Physician office with 6 physicians having a monthly all staff meeting before electronic medical records. I.e., everything is paper. Office Manager: Ok, folks, the docs have an issue related to test results. Dr. Jones, do you want to present this? Dr. Jones: We physicians have been having a terrible time with test results being filed before we see them. The medical records staff is filing them prematurely. This has to stop. Office Manager: How many of you are having this problem? All physicians raise their hands. Dr. Jones: Well, I know how we can fix this. Starting tomorrow, every test result that comes in must be put into an envelope with the patient’s PCP’s name on it and the envelope has to be stamped with the date. A new envelope per physician is delivered every day. That way, all the test results will be distributed daily. The physician will review the test results, put them back in the envelope and put it in their out box to be filed. Any questions? Guess what happens the next day? New tasks. No measurement. No one has analyzed the process to see what the root cause was to having tests filed before they get to the physician. This is how physicians “lead”. More of an authoritative manager type leadership. And most Medical Directorships are filled with non-leader physicians. Again, Non-leader physicians + mediocre administrators = minimal progress. This is really a sin. Nurses, Physical Therapists, Respiratory Therapists, Radiology Techs, etc. do not get any management training to get their licensure. None, Nada, Nyet. Is it any wonder that health care operations don’t work well, since these folks do become the managers? Even when you have someone with manager or leader aptitude, health care systems have not invested in adequate management training. What usually happens is a licensed caregiver in a given field is perhaps more passionate or more conscientious than the others in his/her department. There is manager turnover and they promote the conscientious person. Often, they just start their new manager job without any training. Maybe there are some cursory classes they can take. There are never any mentoring programs. These promoted clinicians either sink or swim in their new jobs. If they sink badly, they get fired (a proficient worker now out of the system). If they tread water they are left alone, even though performance is minimally adequate. If they do well, they get promoted again, usually eventually over the limit of their competence (The Peter Principle) but by then, they’ve been around so long, and everyone else around them is a mediocre manager, they maintain their positions. Not much progress. Operational difficulties. No vision. Again. I hired a person to oversee a non-clinical function in a health plan. She had spent several years as a manager in the banking industry. During her interviews and orientation she related the training programs the bank had put her through. They were very organized and comprehensive. And many hours/days long. I’ve never seen anything in health care that got near what she got for management training. The health care system wouldn’t give her credit for the years she was a manager in the bank when they determined her compensation because “it wasn’t in health care” even though she was the best trained manager I ever hired. Go figure! I’ve mentioned this before, including the above, so I’ll keep this section short.. Health care training programs for managers are superficial and lack validation from something like the Kirkpatrick Model for proving their effectiveness. As I said before, if there is a “training program” it is some degree of classroom activity (education, not training) with no follow-up and no mentoring program. Then, when a manager has “bad numbers” like low employee satisfaction or financial numbers, they get disparaged by administration and put on corrective action plans, when the corrective action plan should be the administration actually training managers. I’ve talked about this in previous posts. As in the office staff meeting above, “improvements” in health care systems are usually the addition of tasks that have not been validated or proven to be an improvement. Usually a manager just comes up with an idea and wants it implemented the next day. I’ve actually been in high level C-suite meetings where a performance or operational issue came up where a senior “leader” who has no knowledge of the department, its processes or its issues, blurts out a fix and wants it implemented by the next meeting! Not “could we have a diagnostic assessment of what is causing the issue with options for improvement” or anything like that. But it has to happen because he is a senior “leader” giving an order. Kind of a culture of fear issue. Health care administrations do not understand process at all. They don’t want to take the time to break processes down and redesign them to be efficient and reliable. They don’t understand process reliability or human factors, even though the vast majority of interactions with patients are human to human. A health care system I was in actually had a person, who was nationally known from a health care “improvement” consulting organization, give a talk about health care process reliability. It was the most superficial, uninformed presentation I have ever heard about the subject. And everyone at the presentation was sooo impressed with the presentation. Just ignorance, really. If you really want to know about what you need to create and maintain a highly reliable organization with reliable processes read “Becoming a High Reliability Organization: Operational Advice for Hospital Leaders”, AHRQ Publication No. 08-0022, April 2008. Now that’s the presentation that should have been given. I don’t know if any health care system has adopted any of what is in this treatise. It’s almost ten years old now. The answer to any business/operations problem in health care is: add more people. Eliminate the PC in the exam room. No monitor, keyboard or mouse. Utilize a large Microsoft surface (13-15 inch) or an Apple iPadPro. The provider wears a headset connected to a real time dictation application, like Dragon. The provider carries the tablet from room to room. Since most practitioners use 2-3 rooms, there is less cost for hardware since you only need one tablet per practitioner instead of 2-3 PC’s with keyboards and mice. The practitioner enters the room, introduces him/herself and starts taking a chief complaint and history. In real time, like a pathologist does while doing an autopsy, the practitioner dictates the history, asking the patient if he/she is relaying the information accurately. Then the practitioner does the physicial exam, dictating the findings in real time through the headset. The practitioner then sits next to the patient and they both view the tablet while the practitioner and patient develop the care plan, the practitioner orders any necessary tests, treatment or medications. The practitioner has the patient validate that what he/she has dictated is accurate and that the patient is in agreement with the plan, then discharges the patient in the EMR in real time. Here’s the final story of this post. Still about throwing people at operational problems. I’m a VP/Associate Professor of Medicine at a Family Practice Residency Program. The billing office Director comes to our upper management meeting complaining that they are missing the encounter information to bill Medicare, Medicaid and insurance companies for things that the residents did in the hospitals. This was a large amount of revenue lost each month. The President of the program tasks the Dean of Academic Affairs to convene a group to solve the problem. The Dean says he will do that, but he knows how to fix this already. Since I had been trained in Process Improvement in a previous position in another organization, I volunteered to be on the “team”. Every Monday morning the residents had a resident’s report and education session. During that session, on a rotating basis, one of the residents would run around the room and ask the residents what they had done to patients FOR THE PAST WEEK! Now, physicians are smart, but, thinking they can remember every billable service they did for a week was pretty naïve. The resident collating the data had a sheet for each resident which once completed, he handed in to the business office. These forms went through the business office processes to generate bills. At the same time, residents had to submit proof of their doing certain procedures (like spinal taps) in order for them to meet certification requirements to become board certified. What they were doing currently was jotting these procedure down on scraps of paper or in a pocket notebook with the pertinent patient and procedure information and the date. At the end of the year they would dump this information on the administrative staff to organize and data enter it into a residency program database. This data would be retrievable at time of certification. A 5×7 “patient card” with all the common service procedures and their CPT codes would be printed in bulk and distributed to hospital wards at the nursing stations. When a resident admitted the patient, they would stamp a card with the patients hospital card information (they looked like credit cards) and check off the procedures they did at admission. When the residents had their daily attending rounds the next day, where they presented the cases of all of their patients daily to an attending, they would hand the card to the attending, who thereafter kept the cards in a deck. As the residents gave report on their patients, the resident would recite the services provided during the past 24 hours including the CPT code (this taught the residents CPT coding, an extra benefit!). The attending checked off the CPT codes (the resident never touched the card after handing it to the attending). When the patient was discharged, the attending put the completed card in a locked box in the daily resident’s report room. Every day at 3:00 PM, someone from the business office would unlock the box and carry the cards to the billing office where the card went through the revised billing office process. At the same time, the procedures required for the Family Practice certification were also gleaned from the same cards and data entered into the programs certification database. Billings soared! The President was almost gleeful about it. The residents learned about coding. The residents didn’t have to independently track their documentation of procedures needed for certification. The administrative staff didn’t get a dump of procedure information in big boluses once a year. The funniest thing about this experience was, the Dean didn’t want to present this to the residents. He was convinced he would be lynched by the residents. So, I volunteered to present it. At the end of my presentation they said, “What? I only have the card on day one of an admission?” Me, Answer, “Yes!” Residents, “And I don’t have to keep track of my procedures?” Me, Answer, “No!” The next thing was a standing ovation! The Dean missed an incredible engagement opportunity! It’s not currently in health care systems’ DNA. As is usual in health care, they don’t actually report the success other than adoption. Just add people. Push for adoption. Same ol’ same ol’…. Addendum September 21, 2017: Here’s another example. in an article in the Annals of Family Practice (“The Chief Primary Care Medical Officer: Restoring Continuity, Noemi Doohan, MD, PhD, Jennifer DeVoe, MD, DPhil; ANNALS OF FAMILY MEDICINE, VOL. 15, NO. 4 ✦ JULY/AUGUST 2017) the authors propose adding a “Chief Primary Care Officer” to promote improvements in continuity of care and communication across caregivers to improve patient care. So, let’s just add another $300,000 C-suite position to the Chief Executive Officer, Chief Quality Officer, Chief Information Officer, Chief Operations Officer, Chief Medical Officer and Chief Nursing Officer. The first question is, what are all of these other “officers” doing? What is needed is systems improvement not another expensive C-suite Executive. If every hospital system in the country (including “solo” hospitals) hired a CPCO, as these two naive MD-PhD’s propose, the cost to the US would be around one billion dollars, using $250,000 as a salary and benefits estimate. Really? How about spending that on designing reliable health care processes. First, the FDA, again. There were two articles published this week (August 15, 2017) illuminating more on how the FDA favors the drug and device industries. In the first article, entitled, “Characteristics of Pre-approval and Post-approval Studies for Drugs Granted Accelerated Approval by the US Food and Drug Administration”; Huseyin Naci, PhD, MHS; Katelyn R. Smalley, BSc; Aaron S. Kesselheim, MD, JD, MPH; JAMA. 2017;318(7):626-636, the authors analyze the research studies for 22 drugs that were given 24 indications under the accelerated approval process of the FDA. Accelerated approval is applied to drugs that treat serious or life-threatening conditions (like cancer, HIV, etc.). “Pre-approval” means studies that were done before the drug was FDA approved and “Post-approval” means the drug is studied after it is released to the public after being approved by the FDA. The post-approval time is when drug companies sell their drugs to the medical community and MAKE MONEY! Remember that the lower the number of people in studies, the more unreliable the studies are. Surrogate measure True Clinical Outcome measure Why is this a problem? Increase in mammography rate Breast Cancer Survival Improving a process to increase a “process measure,” like a rate, doesn’t necessarily mean a patient will actually benefit from the intervention, in this case, not die. “The quality and quantity of post-marketing studies required by the FDA to confirm clinical benefit varied widely across indications. There were few statistically detectable differences in the key design features of trials conducted before and after approval. Nonrandomized studies were common in the accelerated approval pathway both before (60%) and after (44%) market entry. Even though the majority of completed studies showed positive results in the post-marketing period, all completed confirmatory studies demonstrating drug benefit evaluated surrogate measures of disease activity rather than clinical outcomes”. “Question: What is the quality of clinical studies and data used to approve modifications to high-risk devices by the US Food and Drug Administration (FDA) panel-track supplement pathway? Findings: In this descriptive study of 83 clinical studies for 78 panel-track supplements approved between 2006 and 2015, 45% were randomized clinical trials and 30% were blinded. Of the 150 primary end points in these studies, 81%were surrogates and 38% were compared with controls. Meaning: There are limitations in the quality of the studies and data evaluated by the FDA to support modifications of high-risk devices. So, for drugs for life-threatening illnesses with serious side-effects and toxicities, and for medical devices that are considered high-risk, the FDA approves based on data that is, at most, only suggestive. And when a post-approval study demonstrates no effectiveness, only once is 25 years, has the FDA rescinded its approval. Things that make you go “Hmmmm”, right? Here are two articles that show that physicians and APCs are doing things they shouldn’t, costing million of dollars and with risks to patients as part of the clinical scenario. And, the recommendations and conclusions in the articles are examples of the legacy way of thinking within the medical community,. The first article is: “Eliminating Creatine Kinase–Myocardial Band Testing in Suspected Acute Coronary Syndrome”; Matthew D. Alvin, MD, MBA,MS, MA; Allan S. Jaffe, MD; Roy C. Ziegelstein, MD,MACP; Jeffrey C. Trost, MD; JAMA Internal Medicine Published online August 14, 2017. The article goes on to say that there are clinical situations that have been cited where doing a CK-MB has actually negatively impacted patient care. In a non-health care environment, like manufacturing, the industry would simply eliminate the opportunity to “do the wrong thing”. This would be the highest ranking and most effective intervention for mistake proofing the “diagnosis of heart attack” process. Remember this mistake proofing “solution starter”? The highest impact solution is eliminating the step or option that causes the error. In a true “error reduction” environment, you would just eliminate the option of ordering a CK-MB for a heart attack. It wouldn’t be on any lab order sheet. If a physician ordered it, it would be rejected if the indication was “rule out heart attack”. The methodology and theory of the blueprint and quality improvement initiative are based on the US Health Resources and Services Administration strategies for developing and implementing a quality improvement initiative, with a focus on education, action, and measurement of results. The leader of each institution should assess applicability of this blueprint based on the CK-MB ordering frequency at their respective institution. a.Prior to implementation, it is important for health care leaders to establish sufficient organizational readiness for change, specifically in conjunction with these stakeholders, whose ordering practices will be affected by such changes. Tools to measure readiness for change have been previously studied and may be used. b. Collaborate with physician representatives from the departments of cardiology, internal medicine, and emergency medicine. Frontline physicians in these departments order the majority of cardiac biomarkers within most health care institutions and are the primary stakeholders in the current system of care for ACS patients. c. Academic institutions must engage the house staff as members of the quality improvement team for an effective initiative. d. Collaborate with secondary stakeholders, such as pathology and/or laboratory staff, to acquire insight and advice on these changes. c. Inform physicians that CK-MB adds to the health care system financial burden without adding value to patient care. d. Present the evidence supporting elimination of CK-MB and exclusive use of cTn to diagnose AMI, identify reinfarction, and estimate infarct size. Education may be provided through various venues, including lectures, pocket cards (Figure 2), online modules, social media demonstrations, and simulations. a. Number of cTn and CK-MB tests ordered, including stratification by department and patient setting (ED, inpatient, medicine vs non medicine units, ICU vs non-ICU). b. Incidence, missed diagnoses ,and mortality of AMI to ensure patient safety. c. Review cases where CK-MB is still ordered to determine if it provides value. d. If necessary, track usage by physician to develop performance feedback profiles. e. Calculate reduction in charges to patients and health plans, as well as any decrease in hospital costs. Because health care is mostly a consensus environment rather than a just do it environment, the above has a huge amount of unnecessary work (anything in the red zone solution area) and lead time to implementation delays because the one green zone intervention is an ELIMINATION solution. The only work that really needs to be done is inform the practitioners that current national guidelines eliminated the ordering of the CK-MB test for heart attacks and it will no longer be available for that indication. If an institution wants to insert an alert that pops up in an EMR to inform the practitioner, that should be the only additional work. All of the rest of the above is WASTE, and health care systems already have too much waste already. The problem is no one in health care has the balls to just say NO when something is inappropriate! You have to “baby” the practitioners through it even when it is extremely obvious. I’m all for Prochaska’s readiness to change and getting buy-in and engagement for many things (like actual process re-design and implementation) but not in a case like this where it is cut and dried as to what should be done and the intervention is a single step (really, elimination of a step). In the Lean world, they would call a lot of the red zone interventions above “over-processing” (doing more work than necessary to get the desired result). This statement is not supported by any data in the article. It is just blaming! I personally don’t know any Primary Care Physicians who would order the battery of imaging tests that would constitute staging for breast cancer. Stating this in the article is completely inappropriate. Finally, the authors bemoan the overuse, but don’t put forth one single recommendation as to how to reduce or stop unnecessary staging in the patients with early disease confined to the breast with no or limited lymph node involvement. This seems to me to be another “eliminate” [Green Zone] candidate. What should happen is, any imaging center that gets a request for breast cancer staging has to demand the clinical information that supports the ordering of the testing. If the clinical information is “the patient has early disease confined to the breast with no or limited lymph node involvement”, then the testing should be cancelled. ELIMINATE the testing. I actually approached a large radiology group in one state where I was working and asked if they would do this. Radiology request forms usually have three parts: 1) the test you want to order (like, X-ray of the leg), 2) why you want the test (like, “suspect a fracture”), and 3) some clinical information (like, “patient fell 30 feet from a scaffolding. Leg pain. Leg is deformed on examination.”). Nowadays, it is hard for a PCP, Hospitalist or ED practitioner to remember and keep track of which radiology test is best for the clinical situation at hand, especially tests like CT-scans, MRI’s and Ultrasounds. But, Radiologists should know, shouldn’t they? Well, THEY DO! For example, their specialty society publishes the indications for all of these high tech tests that are used in breast cancer staging. So, I asked them if, when they got a request for an imaging study and the request form information didn’t match the indications for the test that was ordered, would they contact the ordering practitioner and either get further information that would justify the test or tell the ordering practitioner they had ordered the wrong test and an alternative test was the best test and they would like to substitute the best test. This sounds simple, cost effective and helpful for the patient (because, when the wrong test is done, eventually the right test needs to be done. For x-ray tests, patients get extra radiation exposure. They also might be subject to increased out of pocket costs because they needed two tests instead on one). Nope. Instead it was , “Oh no. Our role is to do whatever the ordering practitioner orders.” (Does this sound like Nazi Germany to you? “I’m just following orders!”). So, I said, “You know, when I have a patient in my exam room with abdominal pain and I think they have appendicitis, I don’t send them to the surgeon ordering an appendectomy and he/she just does the appendectomy. I send them to the surgeon and ask for a surgical evaluation and a recommendation as to the next course of action. Maybe that’s an appendectomy and maybe it’s not. That’s what specialists do, other than you. Are you saying you don’t want to behave like a specialist? And so there it is for imaging studies. Radiologists don’t want to act like specialists who know what the best thing to do is according to their own society’s guidelines!” Want to know why? BECAUSE THEY MAKE MORE MONEY DOING THE EXTRA, WRONG TESTS!!! After all, it’s all about the money. I’ve mentioned this problem before, but it manifests in more than one way in health care. There are plenty of articles reporting that the Patient Safety Movement, which is now over 20 years old, has gained little movement in those 20+ years. If you go to a surgeon and ask them what their surgical complication rates are, they quote the national averages and that their rates are similar to the national average. You see, being OK with being average or having average performance is being OK with being OK. Even in those commercials, being OK is not OK. Right? Don’t you want better than a “C” performance? From everything? Your car? Your smartphone? Your surround sound system? YOUR HEALTH CARE??? Just OK is not OK! Try it sometime. Ask your health care practitioner what their performance scores are. Ask your PCP what his/her hypertension control or diabetes control rate is. What is that performance compared to national performances. More than likely s/he hasn’t a clue. Maybe if they actually read a practitioner performance profile they get from a health insurer they might know their own performance data, but, most practitioners throw them into the circular file (anyone under 30 know what that is?). Here’s an example. I had to have a major abdominal surgery. I chose a surgeon I knew and whom I respect (she is a terrific surgeon!). At the pre-op visit, I asked her to go through the risks and complications of the surgery. She was very knowledgeable in the national averages, which I already knew. So, then, I asked her what her personal complication rates were and she said her hospital rates were the similar to the national averages. I said I was more interested in her personal rates. She said she didn’t know that. I told her that, since she was working in an integrated health care system (Physician Group + Hospitals + Health Plans) and that, especially for the system’s health plan members, they had all of the data necessary to calculate her own personal complication rates, she should know her personal rates. She said the surgeons had asked for that, but the system had never made that happen. The reason? The finance folks running the system didn’t perceive that that would help the health care system improve their bottom line (remember, it’s all about the money). First, it costs money to prepare those kinds of statistics. Second, people coming back in for treatment for complications adds to the bottom line….except for “capitated” patients (pre-paid monthly), of which this system has a significant number, but their thinking is still “fee-for-service” (the more you do the more you get paid). In actuality, being excellent in post-op complications would lower the cost per patient in their capitated population. But, of course, your expecting C-player MBA’s to understand this. And the doctors don’t even know how the system is getting paid. So, let’s have a short lesson in math. To calculate the rate of something in a data set (for example, the cost of a house in a state) you have many data points. Using the house example, not every house has the exact same sale price, so the values for the sales prices in dollars are variable. You’ll see periodic articles in your local newspapers about house prices. Data sets have what’s called a distribution of values (sales prices). Some houses may cost as little as $100,000 and some as much as $2,000,000. When you graph the number of houses against the price of the houses you get a “distribution curve” which usually comes out looking like a bell, so, they call them “bell curves”. There are two basic types of bell curves: a normal one and non-normal one. A normal curve looks just like the Liberty Bell: symmetrical. A non-normal curve has a tail on it either on the right or left side. In the case of houses, the tail is usually on the right, since houses over $1,000,000 are usually less prevalent than houses less than $1,000,000. For example, in most states or cities, most houses are in the $200,000 to $700,000 range. Now, there is a statistical test for “Normalcy” called the Anderson-Darling test. If that test says your bell curve is normal, then it is OK to calculate and use the average of the data set. If the test says your data is not normal, you can’t use the average because the average will be skewed towards the tail of the curve. In the house example, the average house price will be artificially high because the prices skew (or drags) out to the right (higher prices). Therefore, you have to use the “median”, which is defined as the value for which 50% of the values are lower and 50% are higher than the stated value. In other words, it is the value separating the higher half from the lower half of a data sample. If you notice, house price reports usually state three values: The range of prices (e.g., $100,000-$3,500,000), the average, and the median. Almost without exception, the median is lower than the average and is more indicative of your experience in buying a house. Having worked for years in health care data, often, health care data to have a non-normal curve. As a matter of fact, Medicare, about 25 years ago, figured this out relative to the DRG length of hospital stays (in days). A DRG is a Diagnosis Related Group (like, Pneumonias), and Medicare pays a lump sum (like, $8,000) for a hospital stay for a DRG (of, say, Pneumonia). They have an “outlier” payment if the length of stay exceeds what they historically called the average length of stay (ALOS). (actually the ALOS is used extensively in the health care insurance industry when it shouldn’t be, it should be the median) Medicare, after about 10 years, realized that hospital lengths of stay, when distributed, did not create a normal distribution. The tail is to the right, like house prices. The ALOS was skewed to the right. For the past 20 years or so, Medicare uses the geometric mean, which, incidentally, is the wrong statistical methodology for that purpose (I won’t get into this here as the explanation is several paragraphs long). It should be the median. Thankfully and coincidentally, the geometric mean approximates the median. I’ve never seen data presented for surgical complications that detail if the bell curve is normal or not. Health care folks love averages, without testing for normalcy. I don’t know whether a complication data set has a higher or lower tail or no tail at all, so it is hard to figure out what it means when a surgeon or the hospital says they are average. But, even if you use the median, it’s really not where you want your health care provider to be. It means 50% of the health care providers in that bandwidth are better than the person you are seeing. Unfortunately, no one knows who those better 50% are. So, your care is a crap-shoot! Whether they use average or median, is that where you want your surgeon (or any health care professional) to be? Wouldn’t you want your health care in the hands of a practitioner who is above average or median? Me, I’d like someone who is an “A” not a “C”. To me that would be 3 standard deviations better than average or median. They don’t report practitioners that way. This is similar to the use of an “index” where one divides their performance rate by the average comparator rate (the comparator rate is usually the average performance of a number of similar entities; for example, the average performance of 400 hospitals who are reporting their data into the hospital data set; and no one figures out if it really should be the median). An index value of 1.0 means the person or hospital is performing at the average of the data set. A higher index score means they are worse if having a lower raw rate is better. For example, post-op infections are bad, so the lower the score the better. If your infection rate is 5% and the comparator average rate is 4%, your index score is 1.25. The problem is, practitioners and health care administrators perceive an index of 1.0 or close to that, as being just fine, or “OK” when it is not. It is better to be as close to the best performing entity in the data set. In the above example, an index of 0.3 might be the best in the group. Another one is scoring by “percentiles”. They like it when they can say they are at the 90thpercentile or better. Scoring by percentiles is the same as scoring school essays on a “curve”. You take the range of scores and take the best score, even if the actual best score is an F, and make that an “A”, then you adjust all of the other scores so at least 60% of the class passes. For example, if all patients with diabetes are supposed to get an annual eye exam, and only 50% get them, 50% becomes the 99thpercentile, 40% becomes the 75thpercentile, etc. People think they are doing “OK” if they are above the 75thpercentile because that is a “C+ and better”, when actually they have a failing performance. OK, enough about statistics, but the above points actually hamper health care performance improvement, which brings us back to why health care continues to be generally mediocre and health care folks are OK with being average. The main reason is, the practitioner, hospital, skilled nursing facility, etc. is not the one who suffers from the complication or medical error. They do not feel the pain. They don’t get the post-op infection, get put on antibiotics, then get C.difficile (a bacteria that causes horrible diarrhea that can be fatal), etc. The patient is the one who suffers. They don’t suffer when they cut off the wrong leg. The patient suffers. And the practitioner feels OK about it because the patient just suffered a complication at the average rate; it was bound to happen, right? So, they will sanguinely report that they are “average”. They don’t try to find out who is best. They don’t strive to be best. No one reports who is best!! (FYI, US News and World Report doesn’t really know, as their results are largely based on process metrics, not outcomes metrics). No one in health care tries to figure out what the best performer is doing and tries to beat that performance to be the best! Even if they do find out who is the best, they usually don’t have the ability or the will to do what it takes to make the improvement. I was in health care for 45 years and there are very few places that try to figure out who is doing it best and how to be as good as or better than the best. You can call me jaded but I don’t see that happening in the near future, if ever, because it is hard to do, and it is easier to settle to be average. Plus, the people running health care don’t have the will or knowledge to make it happen. Perpetual mediocrity. Get used to it. Everything is “OK”.